You will always get cuts and bruises in life and the same goes for your wall. Little cracks and scratches will appear, even in new houses. But you shouldn't have to worry about it. They're easy and fast to repair. Once you start, you'll even want to do them all at once. 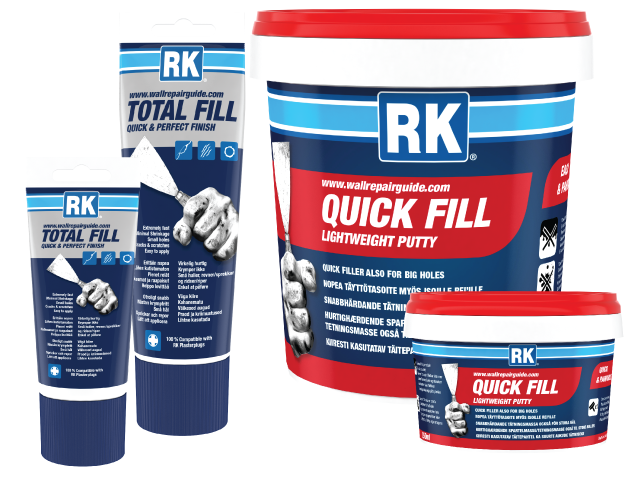 We offer several products for the job but for small scratches and cracks we recommend using either RK Total Fill or RK Quick Fill. Both products are practically non-shrinking so you can usually get away with just one layer but depending on the depth of the hole you might have to use two layers. Depending on your skill you may or may not have to sand the surface afterwards. We recommend you take your time and fill the cracks and scratches carefully. Doing the ground work well is always better than trying to mask visual imperfections with a thick layer of paint. In addition to filling cracks and scratches RK Total Fill is excellent for fixing damage to walls' outer corners. It is easy to apply and you can easily even out the surface to look just like new. An easy to use water-dilutable filler for holes, outside and in. Repairs and fills holes in wood and different types of construction boards and concrete in walls and ceilings. Can be sanded and painted 20 min after application. Repairing the cracks is only half the job. You should also try to look for the cause of the problem. As buildings age, they often experience small structural movement that can cause cracks. In addition, fluctuating temperatures and air humidity will also cause cracking in joints and connections. You might want to consider fixing any structural cracks with e.g. a glass fibre net or if the cracking is apparent in joints, remove the old sealant and replace it with a new one.